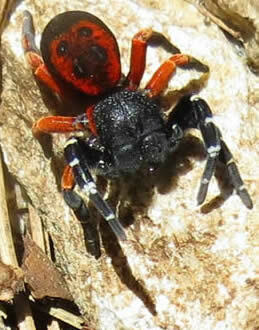 It's amazing how often I find I return from a holiday with pictures of red and black invertebrates. So here they are, for a bit of fun, on one page, with a few others rounded up around the Honeyguide network. 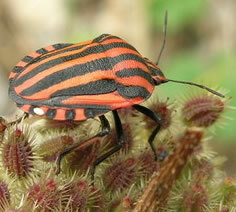 See also our Western Rhodopes bug guide. 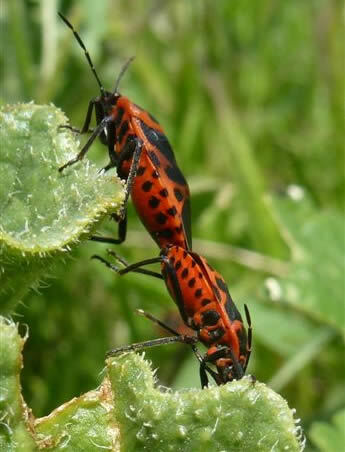 On the right is the first red & black bug that became a familiar friend: the shield bug Graphosoma italicum, sometimes called Graphosoma lineatum. "Bold colour warns of foul taste" says Chinery (who? see below right) which presumably is either true - or an effective bluff - for every bug on this page. Graphosoma italicum on the distinctive seeds of Mediterranean hartwort Tordylium apulum, Crete, April 2013. Graphosoma italicum is common in much of southern Europe, and it was in The Lot in France where I first met them. Honeyguide leader David Collins nicknamed it the Millwall bug. Actually Millwall FC plays in blue: even though Millwall's rugby team are in red & black it was an old football away strip (picture here) that led to this impromptu yet still lingering name. 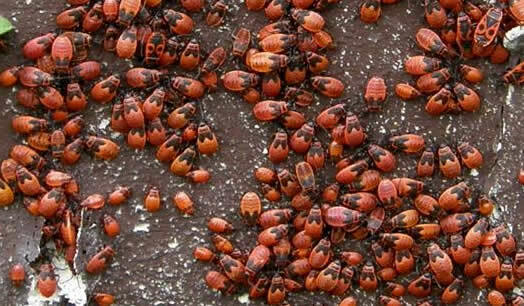 Staying in France, some bugs from the Dordogne. The froghopper (right) - so you might see it half-hidden in spit - seemed too colourful for the UK, but soon after seeing it at Castang I found one at RSPB Strumpshaw Fen, not far from home. 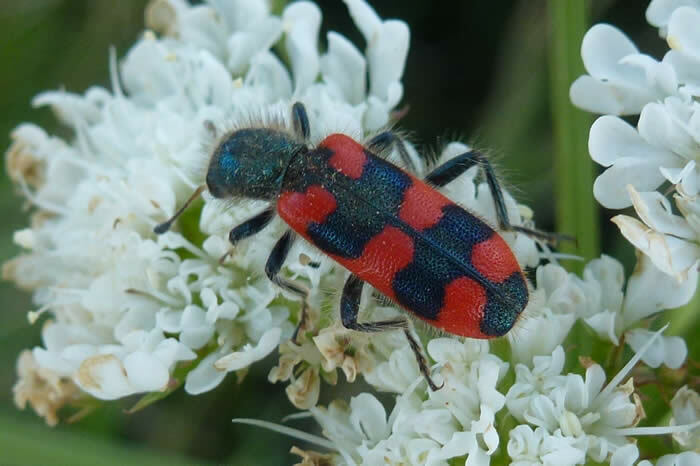 I concede this soldier beetle's red (above) clashes with the pink pyramidal orchid. The front band is straighter on the similar Trichodes apiarus. The larvae are parasites of bees. More on Wikipedia. These are a few of some shield bugs clustered on wild cruciferous plants on Crete in April 2015. It's a brassica bug Eurydema ventralis. See also the side view of the same species in the right hand column. This next group may look obvious at first, but there are several rather similar species, so you need to check them carefully: a photo helps. Ground bug Spilostethus pandurus. Extremadura, March 2009. Below and on the right are two fairly common ground bugs; both are in Chinery. But the bug above isn't. Spain is outside the Chinery's range, so some are in there and some aren't. 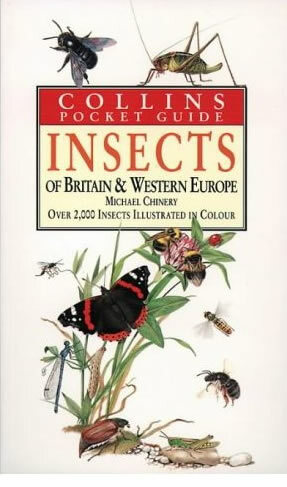 Local leader Martin Kelsey has a useful book on Iberian invertebrates; we found it in that. 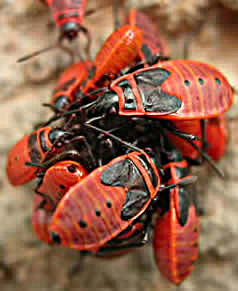 Ground bugs Lygaeus saxitalis. Bulgaria, September 2008. Click on the picture to see it in our Bulgaria picture gallery. Fire bugs (Roger Newman), Charente, France, April 2010. These fire bug nymphs (right) had me really puzzled: they look obvious, but aren't in the insect book. It took some internet searching to pin down their ID. The adults — left — are very striking in appearance. Two more to round off this page. Firstly, a red and black 6-spot burnet moth on the right. Secondly a species that doesn't quite fit here but one that more naturalists are finding, at home and abroad, so well-worth knowing: the introduced harlequin ladybird. More about these here. Harlequin ladybirds, with a larva at the bottom. Norwich, September 2007. We've been pleased to let the Ladybird Survey in Dumfries and Galloway use this photo. Chris Durdin, July 2009, with later updates. Shield bug Graphosoma italicum, in the Cévennes, October 2008. 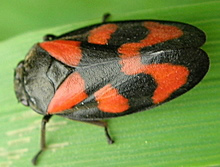 Froghopper Cercopis vulnerata, Castang, Dordogne, May 2008. Trichodes sp creticus? Crete, April 2013. Brassica bug Eurydema ventralis, Festos, Crete, April 2014. 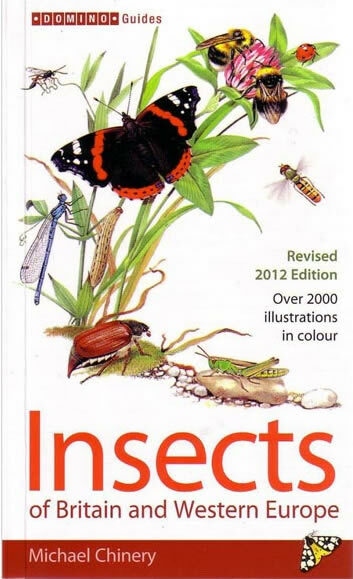 This paperback is our favourite guide to insects and other bugs - it even includes some spiders. Now published by Domino, most Honeyguide leaders have the original Collins version (below). If you see a hardback book by Chinery, it's not the same, nor as useful in the field. Ground bug Lygaeus equestris, Cévennes, October 2008. The differences in pattern are subtle, but L. equestris has what could be described as a 'saddle' - perhaps that's where its name comes from. Fire bug nymphs Pyrrhocoris apterus, Dordogne May 2006. 6-spot burnet moth, Castang, Dordogne, May 2009. 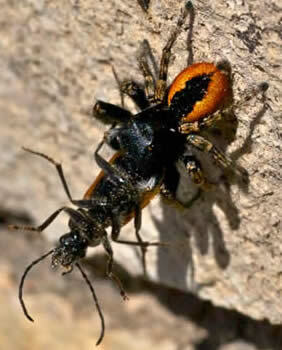 Red jumping spider, Philaeus chrysops with prey, Crete, April 2011 (Phil Brew). Ladybird spider, Bulgaria, June 2012 (Chris Gibson). 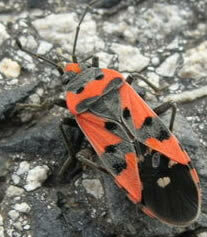 See also our Western Rhodopes bug guide.